[ARCHIVED THREAD] - Opinions on this please. I'm pretty amateur when it comes to photography. I certainly enjoy it, but it's not often that I get to take my camera out and have fun. Here's a picture I took the other day and touched up with paint.net, and for some reason I just really like it. 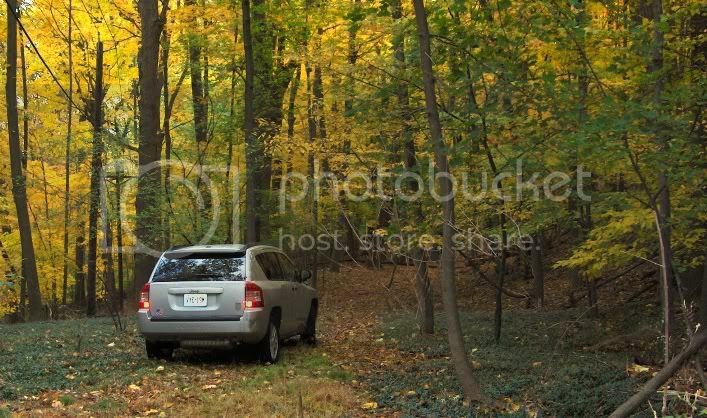 I think it has more to do with how the car is pointed forward in the seeming wilderness ready for adventure. Tell me you what you guys think. Thanks, and any advice is welcome. Used an HP R717 6.2 megapixel camera. Were the taillights on or is that just the reflection of a flash? It's a good shot, but, The subject is centered in the frame. This is one of photographys #1 rules. I think it's called "the rule of thirds". Also, with the car so far away, it is hard to make out any details on it. I agree that it's a good shot and you did a good job of adjusting the colors to bring out the leaves. Hope you don't mind, but I did a little edit to show what M-60 is talking about. Most of the area in front and to the left of the vehicle is just dead space that distracts from the subject. By cropping in closer the viewers focus goes right to the vehicle and the path is more visible. By moving the vehicle a little off center with the front of the vehicle pointed towards the empty space it visually "has room to move" down the path. By moving the horizon towards the bottom of the frame it shows how tall the trees are and their bright colors are much more noticable. (That's another composition rule, keep the horizon towards the top or bottom, never in the center). Another tip if you can remember it when shooting (I never can) is to take a minute to look things over and remove distractions like the slim branches that are sticking up in the foreground. You can remove those in photoshop but it takes more skill than I have to do it without it looking like something was removed. ETA: I wonder how it would have looked with the headlights on high to light up the path. Might not have worked but it's worth trying next time. Exactly what I was getting at. That crop makes all the differance. Thanks for the advice guys. The tail lights were not on, that was just a reflection I believe from the flash. I have this picture on my desktop and it is zoomed into the car much like the one you fixed up Hoplo; and after looking at it I did wish I put the headlights on because in the picture it almost looks like it's dark enough for them to be on. I'll be going home again this weekend and I'll see what else I can come up with considering all the new and great advice. Thanks guys. I removed the distracting branches in the foreground, auto corrected the colors and cropped. It would be a hell of alot nicer if you got rid of the car.